On Tuesday, BART settled a federal civil rights lawsuit filed by the mother of Oscar Grant for $1.3 million. Grant was shot and killed by former BART police officer Johannes Mehserle on a train platform on New Year’s Day 2009. Mehserle was convicted of involuntarily manslaughter in 2010 for Grant’s death. Last year, Wanda Johnson, Grant’s mother, filed a $50 million wrongful death lawsuit against BART. Her claim alleged that Mehserle, along with other BART police officers, violated Grant’s constitutional rights. According to Dale Allen, an attorney hired to defend BART against the suit, Johnson’s claim alleged that the officers had acted with the intent to harm her son. Had the civil suit gone to trial, rather than being settled out of court, a jury would have been asked to decide whether or not Grant was resisting arrest and whether Mehserle had a reason to use his taser, let alone a gun. In 2010, BART settled with Grant’s now seven-year-old daughter Tatiana for $1.5 million in a separate civil suit. Burris said settlement talks will continue between BART and other parties who filed different civil suits, including Grant’s father and five of Grant’s friends who say they were mistreated by police officers that day on the train platform. 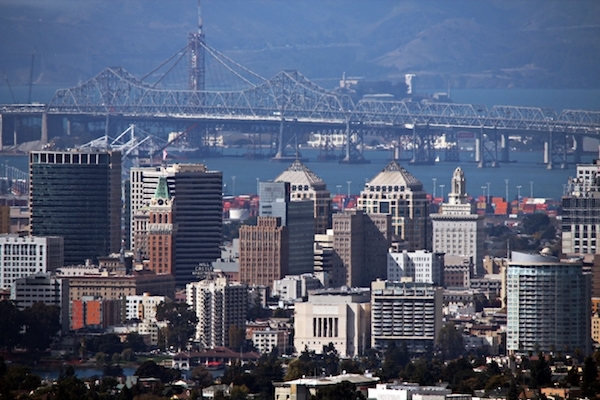 Burris added that it did however prompt positive political engagement in Oakland and that he hopes the issues surrounding Grant’s death will continue to stay in the public consciousness. “The tragic death of Oscar Grant will remain a painful memory for all of us,” BART Board President Bob Franklin said about the settlement in a written press release issued Tuesday. “While we cannot alter the past, we have been using the lessons learned as a catalyst to change our future.” Franklin said the BART board is continuously working to improve officer standards by providing cultural diversity training and is creating an independent police auditor and citizen review board to monitor police practices. 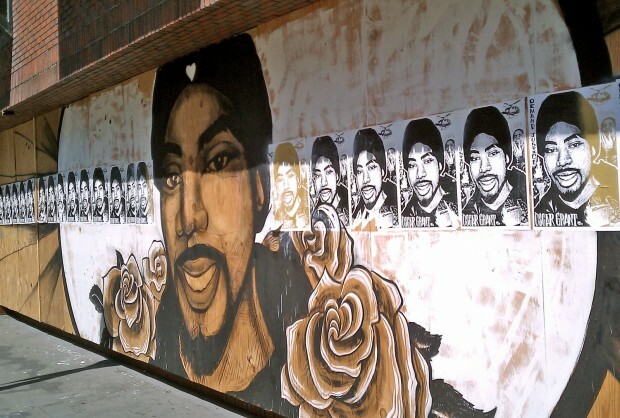 This mural of Oscar Grant, who was killed last year by BART police officer Johannes Mehserle, formerly at the corner of 17th Street and Broadway. Photo by Kevin Fixler.